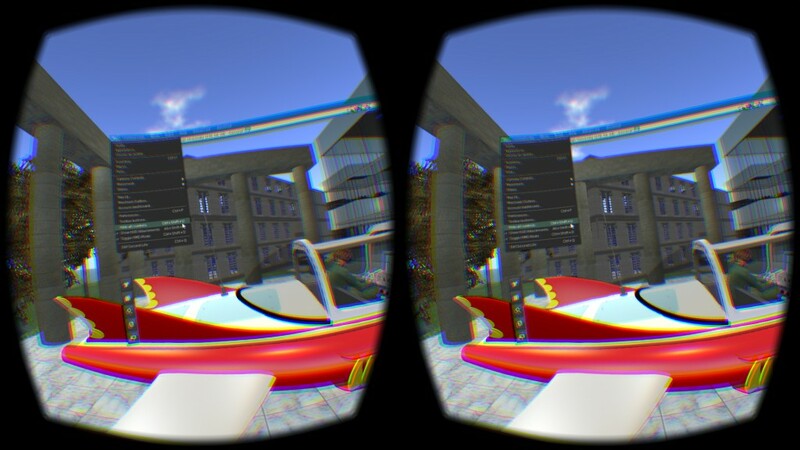 The Linden Lab Rift project viewer is being updated by “VoidPointer Linden” to work with the Oculus Rift DK2 and testing is now taking place. 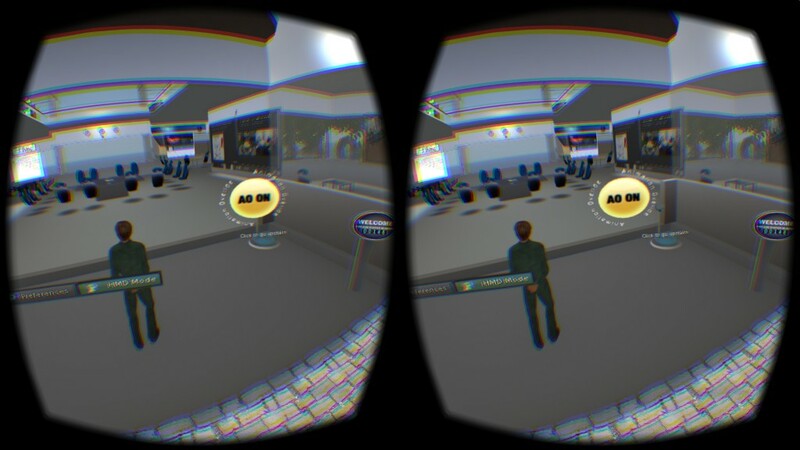 VoidPointer is an enthusiast about the possibilities of the Rift with Second Life and also happens to be a Kickstarter backer for the original Oculus Rift DK1. Here are some first impressions of the currently unreleased recent test build… I think this is looking promising. 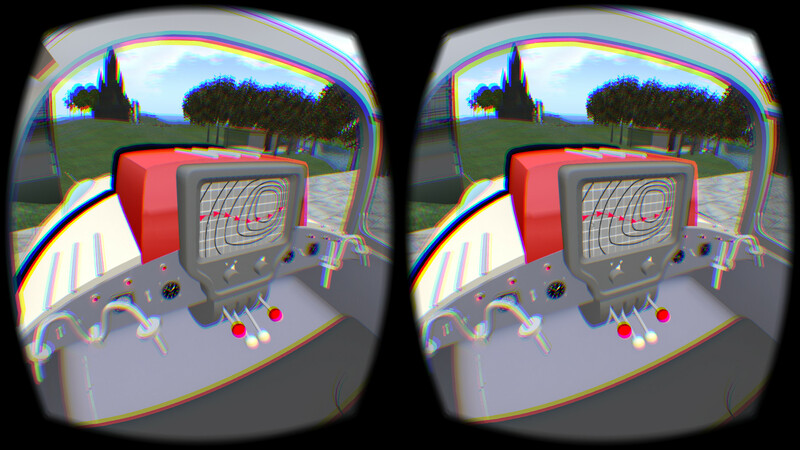 I installed the 3.7.14.293644 version from the Linden Labs automated build system just to give it a whirl with my DK2. I did not have a DK1 to use the earlier released project viewer (3.7.12.292141). Hence this is my first try with the LL Rift Viewer. I set the DK2 to use extended desktop mode with the DK2 as the second screen. In this setup, the “HMD Mode” button (or Ctrl+Shift+D) nicely switched the screen onto the Rift without any further windows movements being needed by the user. I noticed that I was set to view askew to one side, just because the headset was to my side when I entered HMD Mode I assume… and I could not recall if there was a way to centre or ask for a reset of the view. I switched out of HMD Mode (peeked up out of the Rift to interact with the screen) centred my Rift straight ahead, entered HMD mode again and this time I was pointing the right way. This will be an issue I guess as very often you want to get into Rift view, get settled, dismiss the health warning screen and THEN have the screen centred on your view direction. Note that these issues are addressed via fixes to later Rift viewer versions. The “Q” key can be used to align the avatar with the current rift view direction. 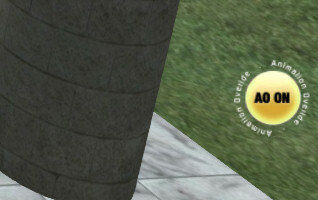 My first impression of the way that Linden Labs show the control bar and menu strips is good. But I think they are much too near the central visual field. The bottom menu strip is down only about 10% in my view. Placing it much lower would work better and make it visible when you look distinctly downwards. Ditto for left and right menu and HUD position areas, they are only about 10 deg off the centre. 45 deg might work better. Note that these issues are addressed via customisation options and presets in Preferences -> Move and View -> HMD Settings. See more information and examples below. I noticed my fps was initially quite low low (30fps on my rig with 1920×1080, ultra visuals, shadows on and my usual 512m view distance… using Intel i7-2600 3.4GHz, 8GB memory, Nvidia GTX580). So, while in Rift view mode, I used the graphics preferences to turn shadows off. This had the effect of making the Rift screen go black. Even my main screen was black. All sorts of clicking, windows move keys, ESC and so on had no effect. I had to use Windows Task Manager to kill the Rift SL Viewer and restart. So there might be a problem with adjustment of graphics settings while in rift mode at the moment. After restart with ultra settings, but no shadows and 128m view I am getting near 75fps in a quiet area in Second Life. Note that the black screen issue is addressed via fixes to later Rift viewer versions. Ctrl+Shift+U turns off the UI elements and controls, but left for me a little grey square with the number of unread IMs/messages in it in the top right of the screen, and my AO icon in the bottom right HUD position. The HUDs could be turned off with Alt+Shift-H (arggg not Ctrl+Shift+H which sent me to my “Home location”) but the little grey IM number stayed on. The lack of uniformity with Alt+ and Ctrl+ for the three needed key combinations for the HMD mode, UI controls and HUDs, and the need to use two hands for these is not good for blind Rift use. 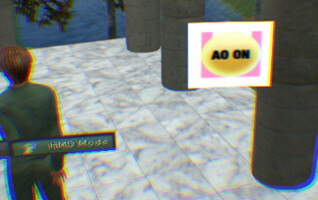 My Abranimatons AO HUD icon is meant to be a little circle with a transparent area round it, but it showed as over a white opaque square in Rift View and that underlying white square box stayed on screen even when the HUD elements was turned off. I found that if I toggled the HUD icon on and off, which would have the effect of changing the texture containing the transparency, then it did show correctly. But the incorrect handling of the HUD icon transparency returned after each login to the viewer. It was murder to find the keys with the Rift on, and trying to lift the Rift up with one hand while typing the three keys needed for UI, HUD and HMD control. A simpler single key one finger toggle may be needed for UI on/off, HUD on/off and for HMD Mode on/off. I understand that mouse look via the “M” key does switch off the UI (though again for some reason it left a white square where my AO HUD icon is meant to be), but I did not really want just first person view. I also had real problems finding where my mouse pointer was… waggling it all over until it came into view. It also seems to be locked to the Rift second screen, so when I tried to pull it back to the left hand main screen it was not visible. 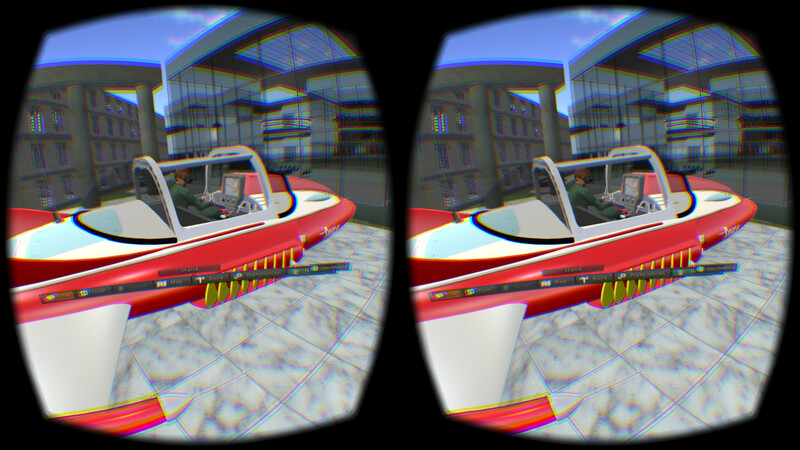 Note that the “Z” key can be used to centre the mouse in the Rift field of view. 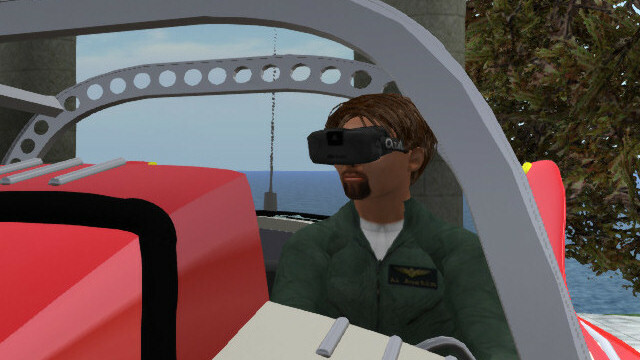 The 3DConnection Space Navigator works fine with the Linden Labs Rift Project Viewer test version to allow simpler avatar movement and “Flycam” camera controls with the usual left click on the device switching between those modes. Many of the issues you bring up can be dealt with in some ways. You can “recenter” the rift using the Q key. This will set whatever direction you’re currently looking as “forward”. No need to exit and re-enter rift mode. Shadows are definitely more of a FPS hog than they should be at the moment – they’re currently being drawn twice and don’t really need to be. There’s a potential optimization for that, but so far, have not had time to work on it. For now, turning off shadows is probably the easiest way to increase your FPS. Switching graphics settings in Rift may well have issues. It SHOULD be booting you back into normal mode when you do so, but apparently, that’s not working correctly any more. Thanks for noting that one. HUDs are still something of an issue. I’ve gotten them to at least show up now, but yes, the alpha channel can still be problematic. Lack of uniformity of key-combos is because many of the commands already existed and have their own key-combos already. I agree that finding the mouse cursor is something of a problem. The Z key will move the mouse to the center of the UI. it’s not ideal, but it’s better than nothing for now. UI positioning is completely customizable. 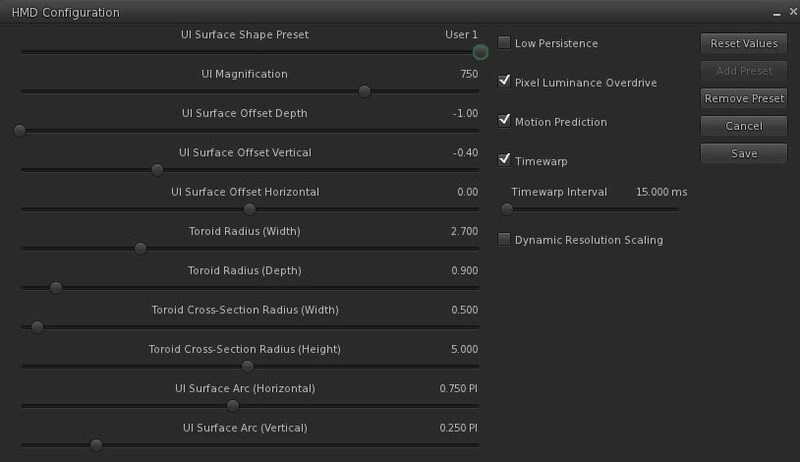 Preferences -> Move and View -> HMD Settings and you can adjust the surface shape and position of the UI. The default setting is just that – a default. 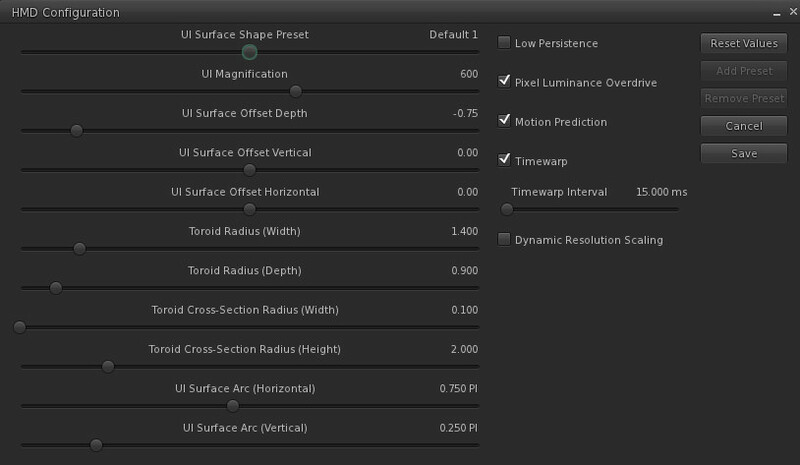 I’ll be adding more presets soon for different preferences of UI surface shapes so you don’t have to muck around with all the sliders if you don’t want to. One interesting issue is that if you place the UI “plane” too far away it can end up behind your avatar or behind seats, etc and hence obscured for using some menu buttons or the “Stand” button. 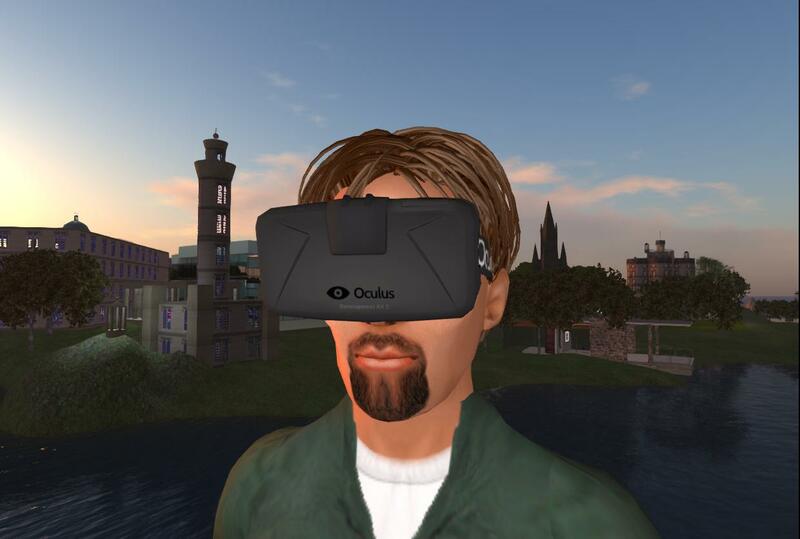 A Second Life Forum is being used for some discussion on Second Life on the Oculus Rift DK2. This entry was posted in Oculus, Second Life, Virtual World, VR and tagged DK2, Oculus Rift, Second Life. Bookmark the permalink.